The Sixty Best Episodes of XENA: WARRIOR PRINCESS (Number Seven) | THAT'S ENTERTAINMENT! With all that said, let us resume with episode number seven on the list. 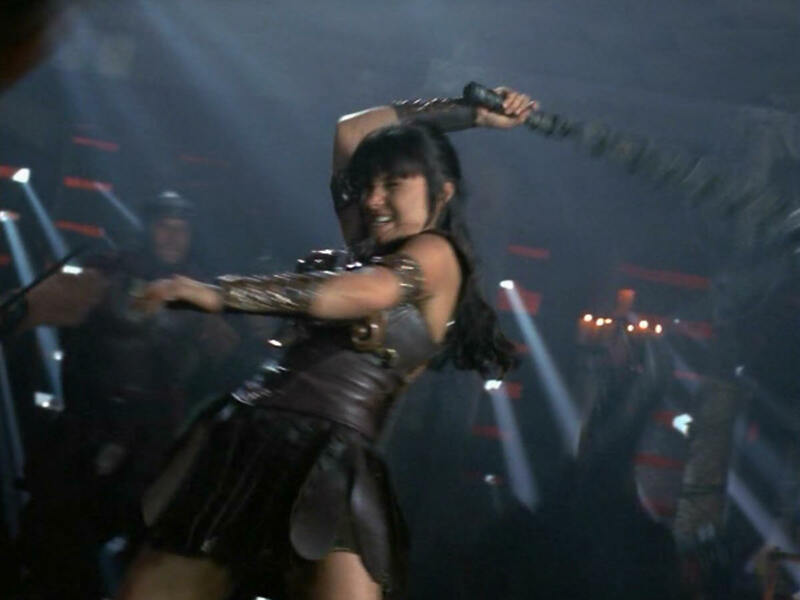 This episode contains one of the series’ longest action sequences, as Xena singlehandedly staves off the advance legion of the approaching Persian army. This heavy episode, while taking great liberties in regards to historical accuracy (What’s new? ), ratchets up the drama with Gabrielle’s life hanging in the balance. “One Against An Army” is one of those grand episodes that is very difficult to forget — essentially it’s everything a good Xena episode should be. The episode opens with Gabrielle practicing her flips. Against Xena’s protests that she’s not ready, Gabrielle removes the staff as a bar of support and tries the flip one more time — spraining her ankle. Gabrielle’s initially too proud to let Xena look at her ankle, so Xena takes matters into her own hands and uses her chakram to slice open Gab’s boot and treat the sprain. Soon they are approached by a man named Phiddipides, who tells the women to run for their lives — an army has come ashore and ravaged the troops at Marathon. It’s the Persian army and if they reach Athens, Greece will fall. Xena sends Phiddipides ahead to warn Athens, while she and Gabrielle will delay the Persians by creating a landslide at Thermopylae, forcing the troops into Tripolis, where Xena and her former army had stashed a cache of weapons that the Tripolis militia can use for defense. Gabrielle tells Xena to go on without her, but Xena insists otherwise. 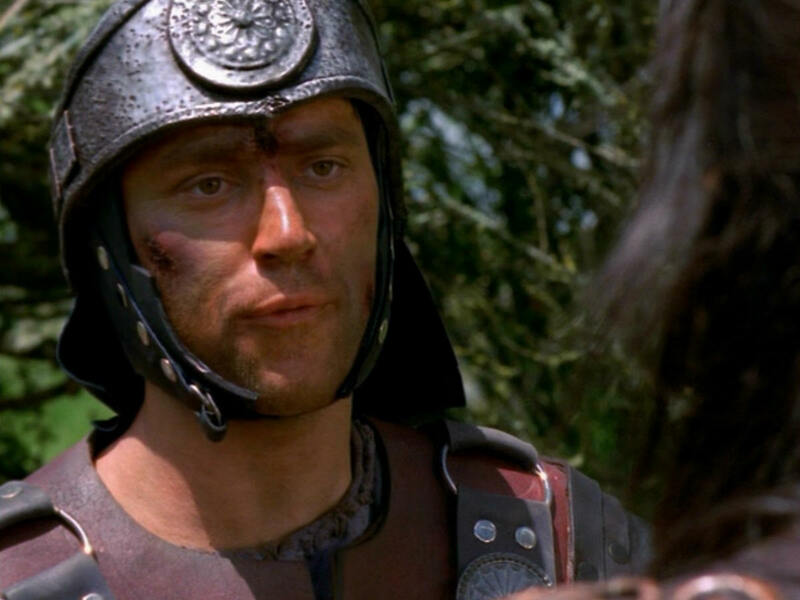 On their way to Thermopylae, Xena and Gab are confronted by Dorian, a soldier in Spartan attire. Xena pegs him as a deserter and encourages him to regain his honor by staying and fighting alongside them. When a small advance scout of Persians approaches, Xena sends Gabrielle and Argo out of the way. But when Dorian bolts again, Gabrielle goes after him — running right into the line of fire and taking an arrow in the shoulder. Xena defeats the scouts and rushes to Gabrielle’s side. She removes the arrow and discovers that the blade has poison on it. Not to worry though — there should be an antidote in Tripolis. Dorian wants to help, so Xena tells him there has been a landslide at the pass and he should go on to Tripolis ahead of them and tell the village to round up their militia. But Xena knows that the man is really a Persian spy; she misled him so that she wouldn’t have to create the landslide. The women arrive in Tripolis and discover that the townspeople burned the village to the ground upon word of the approaching Persians. Without serum, Xena takes a weakening Gabrielle to the armory. Xena wants to go on to Thessaly where they can get the antidote, but Gabrielle demands that they stay and focus on the greater good — defending Greece from the Persians. As Xena prepares for battle (which includes a desperate attempt to harness the powers she had in China), Gabrielle begins to grow delirious — even having a vision of Xena’s death in the upcoming fight. Gabrielle knows she is soon to die, and Xena once again insists that she’s done paying for her past mistakes, her responsibility now is Gabrielle. But Gab won’t have any of this — Xena must stay and fight. Xena sends Argo to safety and carries Gabrielle up to a hidden loft. Xena has set up a boiling pot of oil that she instructs Gabrielle to tip over upon command. As the battle grows nearer, Gabrielle apologizes for her betrayal in China and they exchange loving words, making plans to see each other in the afterlife. The battle starts and Xena is magnificent — sidestepping Gabrielle’s death vision. After Gabrielle tips over the boiling oil, the battle continues onto the roof. 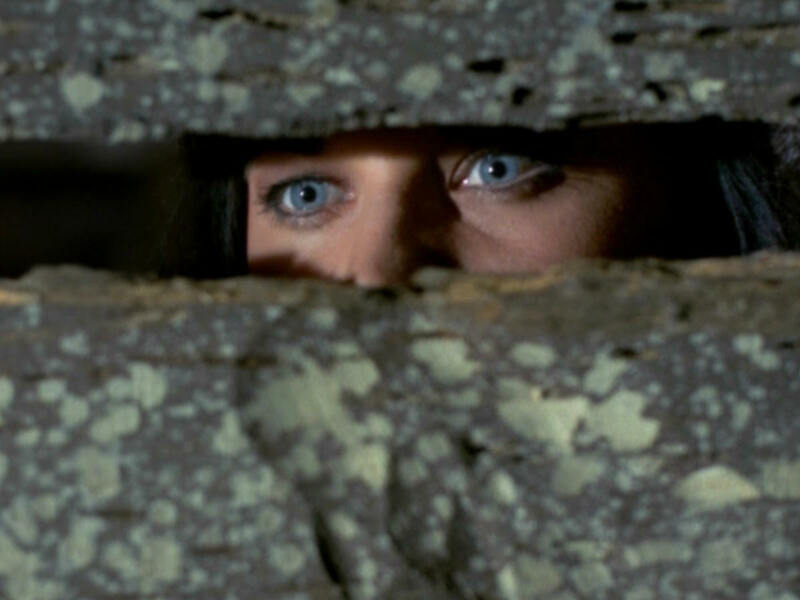 Through a hole, Xena sees Dorian about to stab Gabrielle. Xena descends and stabs him with a poison arrow — “just like Gabrielle”. The battle continues as Dorian crawls across the floor to find a canteen. Xena realizes it’s the antidote and fights harder than ever. The battle comes to a halt and Xena shouts to the remaining soldiers: “Go home, there are thousands more like me!” They retreat and Xena gives Gabrielle the antidote. As they fall asleep, Gabrielle reminds Xena that she’s still owed a new pair of boots for the ones Xena destroyed earlier. So the “historical” stuff in this episode is all jumbled and incorrect, but that’s of little concern to me — I don’t watch Xena for a history lesson. It’s cool when some of that can be incorporated, but I’m glad the series isn’t bound to historical truth and timeline accuracy. I watch for the characters, and in that arena, this episode certainly delivers. We get a lot of heart-to-heart moments between our two heroines and, though I think it does get a bit too schmaltzy for my tastes, I don’t think the sentiments are out of place here in “One Against An Army,” which is visually, narratively, and emotionally epic. I think this is one of the series’ best looking episodes and that incredibly long fight sequence deserves Lucy Lawless some type of award (the ladies on Grey’s Anatomy sure have it easy, don’t they?). The final act is, truthfully, the most memorable thing about the episode, but though the battle is excellent, there’s still much more to this praise-deserving hour. First we have to address the episode’s place in the series as a whole. “One Against An Army” was the first one to air after the highly lauded musical episode that brought Xena and Gabrielle back together after the cataclysmic breakup brought about by the death of their children (for which they both held varying degrees of responsibility). This was indeed the first installment produced after “The Bitter Suite,” and the production number indicates that it was written episodes after. (That clears up any misconceptions about WHEN this episode was supposed to air.) I know many fans wondered why the events of “The Debt” two-parter were addressed here, as opposed to the events of “Maternal Instincts,” which had aired more recently and directly led into “The Bitter Suite.” Well, I think this is two-fold. So this episode has more of an important place in the Season Three story arc than is normally acknowledged. It’s interesting, I think, that an episode so full of LOVE would come immediately after the episode “The Bitter Suite,” which was merely designed to reunite Xena and Gab — not fix all of their problems. I’ve often wondered if another episode was needed in between “The Bitter Suite” and “One Against An Army,” but the truth is — I think fans WANTED some “I love you, Xena” and “I love you, Gabrielle” after the events that had just transpired. So I think this episode actually works with the previous one in uniting Xena and Gab, as the two must face the imminent probability of losing each other. I also want to briefly address the concept of the Greater Good, which the stoic first season Xena taught to Gabrielle in the dramatic and aptly-titled “The Greater Good.” In that episode, which bears some similarities to this one, Xena is shot with a poison dart and Gabrielle must take her place (outfit, wig, and all) to defend a group of villagers. 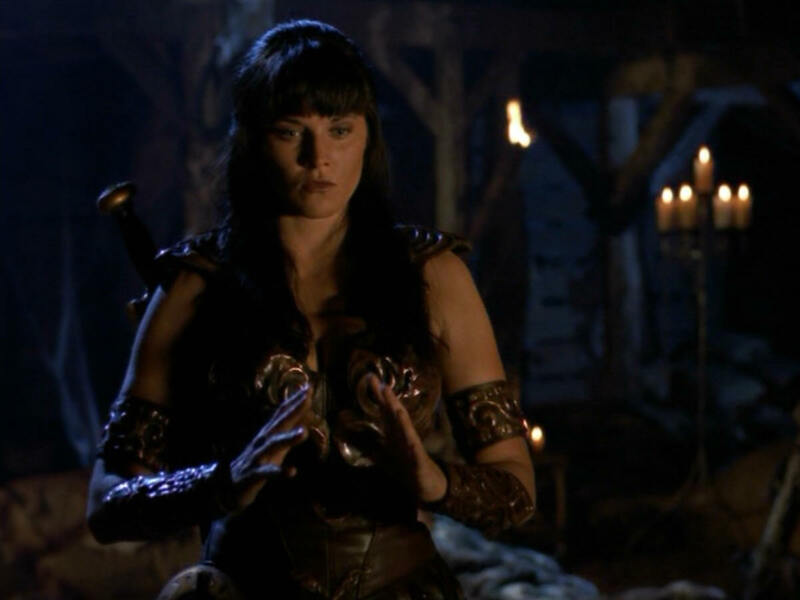 The Warrior Princess insists that Gabrielle stay and fight if/when the poison leads to Xena’s death. In “One Against An Army,” when Gabrielle is hit with a poison arrow, Xena is all ready to forget that darn Greater Good and focus on Gabrielle. This requires more emphasis — Xena would abandon her quest for redemption to save the person she loves. That’s part of what makes her such a complex hero. Gabrielle is much nobler, and we’ll see that more later on in the series. (Even though she initially wants to revive Xena in “A Friend In Need (II),” Gab is still much stronger than Xena is here.) Of course, part of what makes this conflict so great is that it occurs when the ladies are pushed near the breaking point — Xena is SO desperate to save Gabrielle, that’s why she’s ready to stop seeking redemption. The sentiment comes from a moment of weakness. (As we see in the next episode, “Forgiven,” Xena will never ever forgive herself for her past sins — and she never intends to.) Xena’s redemption is the crux of the series — so whenever an episode hits directly on that as a source of conflict, it’s exhilarating. “One Against An Army” is quality viewing for any type of viewer. It has an important place in series, so it’s truly designed for the diehard fans — especially those who melt when our heroines get lovey-dovey. But the episode is incredibly visually, narratively, and emotionally captivating, and thus perfect for new fans. So though there are some important overarching themes that pop up in this episode, the storytelling is episodic, making it an excellent place to start your Xena obsession. With all the power, the passion, and the danger, “One Against An Army” is Xena at its high-functioning best. Come back next Thursday as the countdown continues! And don’t forget to check back tomorrow for another Film Friday post! This is my No. 1 episode of Xena: Warrior Princess. There was a time when I could watch it at least once a week, although it has probably now been over a year since I last watched it. Pingback: THE XENA SCROLLS: An Opinionated Episode Guide (313 & 314) | THAT'S ENTERTAINMENT!